The 18-hole, former European Tour qualifying Golf Course, is undoubtedly one of the most challenging pay and play courses in Surrey and is available for everyone to enjoy. Whether you’re a seasoned golfer or an enthusiastic beginner, our beautiful course has something to suit all tastes. 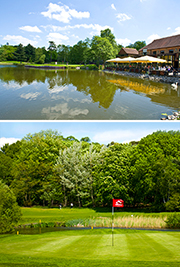 Silvermere has everything a golfer needs to improve their game; a fully stocked Golf Shop, custom fitting facilities, a floodlit driving range, short game practice areas and of course PGA Coaches with years of experience. The extensive choice of pros and our long opening hours means we will always find a way of improving your game around your busy schedule. We know what you’re looking for in a successful society day; a challenging course, helpful staff, great food and dry weather. Well apart from the weather we’ve got it all covered. We have a variety of packages on offer to suit your needs including weekend availability in the afternoons.